It's time for year-end planning. 4th quarter calendar year corporate estimated tax payment due. 4th quarter estimated tax for non-corporate taxpayers due. First property tax payment is due. Calendar year accrual basis corporations should pay related parties. Do you have unrealized capital losses? Estates and trusts should plan distributions. Business retirement plans for calendar year businesses due. Should you buy business equipment before December 31? Seniors, remember to take your required minimum distributions. Remember to take a physical inventory on January 1. Remember to reset payroll on January 1. Should you make additional tax payments before December 31? Should you donate appreciated publicly traded stock? Donating a car to charity? Should you adopt an accounting policy for small equipment purchases? IRS increases expense allowance for materials and supplies. IRS rejects statistical formula for partial dispositions. Exclusion allowed for reimbursement of spouse's group medical plan premiums. IRS audits of individuals are way down. Tax extenders on the agenda. New FTB identification procedure for tax representatives. Cancellation of debt extension fails in California. New California schedule for Heads of Households. California employers will have FUTA makeup payment. Subscribe/Remove from Michael Gray, CPA's Tax & Business Insight. 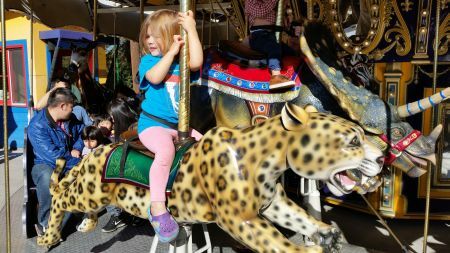 Minnie Siemer rides the cheetah on the carousel at Happy Hollow Park & Zoo. The first night of Hanukkah was Sunday, December 6. Christmas is Friday, December 25. Hope you have a great holiday season with your family and friends, and we wish you a happy New Year! There are very few days left to contact us this year. Michael Gray will be out of the office on December 17 and 18 and after December 23, returning January 4. The year will soon be over! Schedule your year-end appointment now. With vacation and celebrating holidays, the times for appointments will be very limited. Call Dawn Siemer at 408-918-3162 on Mondays, Tuesdays or Thursdays to reserve your appointment now. We suffered a fire which gutted our home, except for the garage. Janet, James and I were left with only the clothes we were wearing and possessions we had with us. We have homeowner's insurance which is paying for our temporary living expenses and should pay for rebuilding our home and replacing our belongings. We are in good spirits and glad to have a temporary residence in which to celebrate Christmas with our family. No one was hurt. Janet and I were babysitting grandchildren and James was at UC Santa Cruz when the fire started. A neighbor left a message on Dawn's telephone that our home was on fire and I arrived to find a bunch of fire trucks and flames shooting through my roof. Is it time to review your coverage with your insurance agent? Fourth-quarter calendar year corporate estimated tax payment is due December 15. The final 2015 estimated tax payment for calendar-year corporations is due December 15, 2015. Not all corporations can base their federal estimated tax payments on the previous year's income tax return. For example, new corporations and corporations that had no tax liability for the previous year must compute their estimated tax using the current year's facts. See your tax advisor for assistance. Fourth quarter estimated tax payment for non-corporate taxpayers is due January 15. The final estimated tax payment for individuals and calendar-year estates and trusts is due January 15, 2016. Remember California taxpayers with taxable income of $1 million or more must pay their estimated taxes using the current year's facts. Consider making the payment by December 31, 2015 for a 2015 tax deduction. Watch the alternative minimum tax. See your tax advisor. The first property tax payment for the 2015-2016 fiscal year in Santa Clara County is due December 10. Avoid a late payment penalty - mail your payment now! Calendar year accrual basis corporations should pay related parties by December 31. In order to currently deduct expenses due to certain related persons, accrual-basis corporations must pay them by the year-end. These include wages, bonuses, interest expense, rent, etc. Be sure to review the status of these items with your tax advisor by December 31. Since the stock market has done so well, fewer individuals are holding stock that has declined in value. If you do, consider selling it before the end of the year. The capital losses can offset any capital gains that you have plus an additional $3,000 can be used to offset other taxable income. Remember the wash sale rule. The loss is disallowed if you buy the same security during the period from 30 days before to 30 days after a sale at a loss. This strategy is especially important for high income individuals who are subject to the 3.8% net investment income tax. The increase in the maximum federal income tax rate to 39.6% and the 3.8% tax on net investment income hit estates and trusts especially hard. They apply when the undistributed trust income exceeds $12,300. If possible, the income of the estate or trust should be distributed to beneficiaries before the year-end, since the threshold for these taxes is much higher for individuals. (The income of some trusts is automatically considered distributed. See your tax advisor.) An election is also available to treat distributions made during the first 65 days of the following year (for example, January 31, 2016) as distributed for a taxable year (for example 2015). In most cases, capital gains don't qualify for the distribution deduction. See you tax advisor. The beneficiaries should be involved in this decision and be informed about the additional income to be reported on their income tax returns (in writing) to avoid unpleasant surprises. Business retirement plans for calendar-year businesses should be in place by December 31. In order to make contributions for 2015, business retirement plans such as 401(k) plans and profit sharing plans for calendar-year businesses must be in place by December 31. Employee contributions to a 401(k) plan must also be paid by December 31. If yours isn't in place yet, contact your retirement plan advisor immediately. The expense election for business equipment purchases is now $25,000. Congress might enact a retroactive increase. Consider making your business equipment purchases before the end of the year. See your tax advisor for details. Generally, when a participant in a retirement plan or an IRA reaches age 70 Â½, minimum distributions are required to be made by December 31 each year. The distributions are also required to be made for inherited accounts. Roth accounts are excluded from this rule during the original owner's lifetime. See your tax advisor for details. Calendar year businesses with inventories should take a physical count as of January 1. This creates a "clean" record for the income tax return. Remember to "reset" payroll on January 1. Software providers will issue updates including the new payroll tax tables as of January 1, 2016. Be sure you have installed those updates before processing your first payroll for 2016. State estimated tax payments and early property tax payments made by December 31 are generally tax deductible for the regular tax. However, many people are finding they are subject to the alternative minimum tax. Deductions for taxes (and miscellaneous itemized deductions) aren't allowed for the alternative minimum tax, so there could be no benefit for a tax prepayment. A tax advisor can project your tax picture to determine if the AMT will apply. Turbo Tax and other tax preparation software can also be used to make the computations. This situation has changed somewhat because of the 3.8% net investment income (NII) tax. Part of the state tax payment may be a "good" deduction for the NII tax even though there is no AMT benefit. See your tax advisor. It's the season for giving. Many of us make extra donations during December to share our bounty with others. Appreciated publicly-traded stock that has been held for more than a year is an ideal asset for a donation. Under the Internal Revenue Code, the long-term capital gain is excluded from taxable income and the charitable contribution deduction is the fair market value of the stock, so there is a double tax benefit. Also, publicly traded stock isn't subject to the appraisal requirements that apply for other property. It's a win-win-win! Remember to get a good acknowledgement letter to document the donation, including a statement that "no goods or services were received in exchange for the donation." Remember that an appraisal is required for noncash contributions with a value exceeding $5,000. See Form 8283 and instructions as the IRS web site, www.irs.gov. (There is a Declaration of Appraiser on the form.) There is an exception to the rule for vehicles donated to a charity. If the charity sells the car, the taxpayer may rely on the sales price disclosed on Form 1098-C. The original Form 1098-C is submitted to the IRS with your income tax return (or otherwise sent to the IRS with Form 8453 if you efile). Should you adopt an accounting policy for small equipment purchases by December 31, 2015? An election is available to currently deduct small expenditures when the taxpayer doesn't have an applicable (audited) financial statement. Items up to $2,500 (see next item for an update) may be currently deducted, effective for amounts paid or incurred for tangible property on or after January 1, 2016, for taxable years beginning on or after January 1, 2016. The election doesn't apply for inventoriable costs. Among other requirements, in order to qualify for the current deduction: at the beginning of the taxable year, the taxpayer must have accounting procedures treating as an expense for non-tax purposes - (1) amounts paid for property costing less than a specified dollar amount; or (2) amounts paid for property with an economic useful life of 12 months or less. The taxpayer must also treat the amount paid for the property as an expense on its books and records in accordance with the accounting procedures. The amount paid for the property may not exceed $500 per invoice or per item, as substantiated by the invoice. Note the de minimus election will be made each year on the income tax return for the business. In order to be in position to make the election for 2016, you must have the accounting policy in place by December 31, 2015 and implement that policy in your accounting throughout 2016. If you didn't have the policy for 2015, consider getting it in place by December 31, 2016. We recommend that the policy should be written. The efforts of the American Institute of Certified Public Accountants and other tax practitioners has paid off. Effective for taxable years beginning on or after January 1, 2016, the IRS has increased the amount that taxpayers who don't issue an "applicable financial statement" (usually audited financial statements) can deduct for most materials and supplies from $500 to $2,500 per item. This threshold should cover most tires and personal computers. Some companies might have to change their capitalization policies to reflect the new limit and qualify for the deduction. The advantage of this election is the deduction doesn't affect the limitation for the expense election under Internal Revenue Code Section 179, so more items can be currently deducted. Remember a de minimus safe harbor election statement also has to be included on the taxpayer's income tax return to qualify for the deduction. The IRS also said it won't make audit adjustments for materials and supplies within the threshold for years beginning after December 31, 2011 and ending before January 1, 2016, provided the item otherwise meets the requirements. A taxpayer submitted a Form 3115, Change of Accounting Method, form to claim deductions for partial dispositions of its depreciable assets under the Repair and Capitalization rules. It computed the deductions using a statistical formula. The IRS didn't accept the computation and disallowed the deduction. The IRS Chief Counsel has issued guidance indicating that an employer can exclude from an employee's income (S1) amounts paid to reimburse the employee's spouse (S2) for amounts paid for medical insurance provided under S2's employer's group medical plan covering S1. For example, S1 has no medical insurance at work. S2 participates in a group medical insurance plan at work that also covers S1 and makes after-tax payments of $100 for S2 and $75 for S1. S1's employer reimburses S1 and S2 for the $75 attributable to S1. The payment is excluded from S1's W-2 income. Thanks to reduced funding to the IRS by Congress, the audit rate for individual tax returns has declined from 291,000 field audits in fiscal year 2014 to 267,000 in fiscal year 2015. The number of correspondence audits increased from 951,000 for fiscal year 2014 to 961,000 for fiscal year 2015. The revenue from examinations fell from $12.5 billion for fiscal year 2014 to $7.3 billion for fiscal year 2015. Congress is making a serious mistake. The easiest way to raise revenue without increasing income tax rates is to simply enforce the tax laws. Now that Congress has passed a budget, it can turn its attention to many tax breaks that expired after 2014. Thanks to Kevin Smith, who wrote to me that the exclusion for cancellation of debt income relating to a principal residence is one of the items that Congress is considering extending. Stand by for more developments. Identity theft is a hot issue with the tax authorities. Beginning January 5, the California Franchise Tax Board will require tax representatives who call the Practitioner Hotline with questions about a client's account to provide their driver's license numbers or state identification card number and date of issuance before providing information about the client's account. The intention is good, but it's too bad that another hoop has been added to working on problems with the Franchise Tax Board. Governor Brown vetoed AB 99, which would have extended California's partial conformity to the federal exclusion of cancellation of debt income through 2014. (The federal exclusion is also pending extension because it expired after 2014.) Many taxpayers were counting on the exclusion when they filed extensions for their 2014 income tax returns. Now they have to deal with California tax due plus penalties and interest. According to the Franchise Tax Board, "the law does not provide a reasonable cause exception for reliance on proposed legislation." Instead of sending audit letters requesting information from individuals who file as a head of household, the California Franchise Tax Board has issued new Form FTB 3532, Head of Household Filing Status Schedule. The form should be included with the California income tax return for those claiming Head of Household filing status. California employers will have additional tax for a 1.5% credit reduction on their Federal Unemployment Tax return, Form 940, for 2015. The maximum amount is $105 per employee. The tax applies because California hasn't repaid its outstanding federal loans for five consecutive years. As you know, more and more people are going to the internet to find information about service providers. We hope you will share some good words about experiences that you have had with our firm<. Some of the sites where you can share your experiences include yelp.com, siliconvalley.citysearch.com, and Google+. Financial Insider Weekly broadcast schedule for December and January. December 11, 2015, G. Scott Haislet, CPA and attorney at law, "Section 1031 tax-deferred exchanges"
December 18, 2015, G. Scott Haislet, CPA and attorney at law, "Sale of a principal residence"
December 25, 2015, Don Pollard, CLU, ChFC, Advanced Professionals, "Medical insurance for individuals"
January 1, 2016, Don Pollard, CLU, ChFC, Advanced Professionals, "Medical insurance for small businesses update"
January 8, 2016, Craig Martin, CFPÂ®, The Family Wealth Consulting Group, "Alternative investments besides stocks and bonds"
January 15, 2016, Craig Martin, CFPÂ®, The Family Wealth Consulting Group, "Investing in turbulent times"
January 22 and 29, 2016, Peggy Martin, ChFC, CLU, "Socially responsible and sustainable investing"